Air New Zealand has dropped the price of their flights from Vancouver to Sydney, Australia down to $918 CAD roundtrip including taxes. The flights have 1 stop each way, in Auckland, New Zealand. There are dates available for this price in a variety of different months in 2018, but the most notable dates are the late December and January dates. 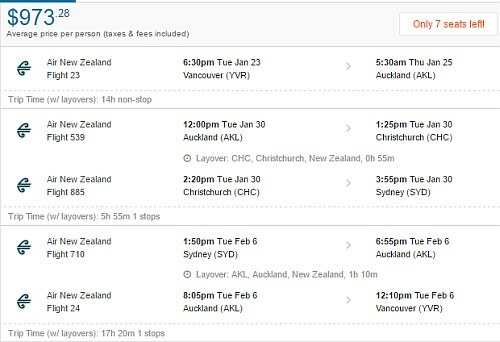 In the recent past, Air New Zealand, Qantas, and Air Canada have been willing to significantly drop the price of their flights from Vancouver to Australia for travel in February, March, April, etc. But they have all generally avoided dropping the price of their January dates down to low price levels. This is kind of like seeing an amazing price to Europe in July or August. The airlines just don't like to drop their prices to certain places in certain months (because of the high demand). NOTE: After your Flighthub search completes, click on '1 stop only' on the left hand side - otherwise you will see some cheap flights from China Eastern (with ridiculously long travel times). ALSO NOTE: After your Flighthub search completes, click on 'Flexible Dates' to see more dates for $918 CAD roundtrip. You can also try it the other way around, and visit Australia first, and New Zealand second. For the first and third flights, try using dates that are the same as the regular roundtrip dates you found above. And then play around with the date of the middle flight to give yourself more or less time in New Zealand vs Australia. 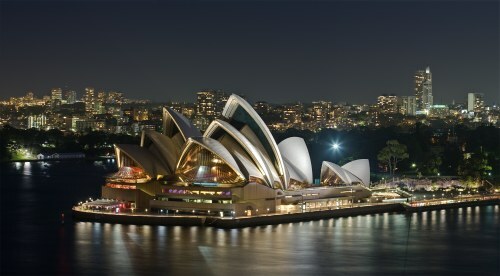 vancouver, yvr, flight deals, air new zealand, australasia, australia, sydney, syd and oceania. 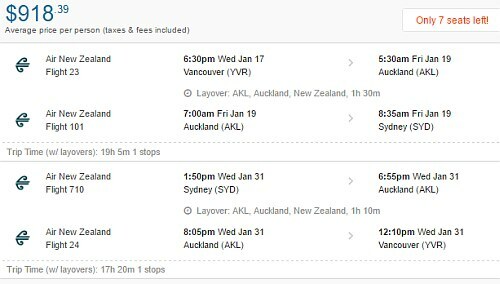 No Responses to "Vancouver to Sydney, Australia - $918 CAD roundtrip including taxes | January travel with Air New Zealand"